Today I have a new series from author duet Catherine Mann and Joanne Rock. As part of this tour, I have reviews, excerpts and a tour wide giveaway for some pretty awesome prizes. If you have a US address, you can win a Great Escape Pack including a heart-print tote, a scarf for going incognito, and cute dark sunglasses. If you are International you could win a print copy of Catherine Mann’s RESCUE ME and Joanne Rock’s NIGHTS UNDER THE TENNESSEE STARS. So, be sure to read on to find out about The Wedding Audition, and then check out the other post today for How to Lose a Groom in 10 Days, and don’t forget to check out the other tour stops where you can see what others thought about this new series! 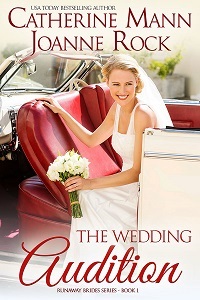 The Wedding Audition is the second novella in the Runaway Brides series by the author duet of Catherine Mann and Joanne Rock. At just under 150 pages, the prequel and this first novella are the perfect afternoon escape, with plenty of romance and clever characters to enjoy. There’s plenty going on in this story, perhaps a touch too many elements that add potential for tension and conflict without really needing to be there. But, I digress. Annamae is a reality television star who just made a huge gaffe on national television, breaking up with her baseball player fiancé. The pressure from the story and celebrity chasers is never ending, so she heads out to take some time for herself and deal with some long-standing family issues. She’s searching for her father, and planning to use the time to decide what it is that she really wants. Wynn is an undercover police officer hiding out in protective custody in Alabama. When Annamae arrives, the constant threat of a media circus is not a welcome sight. And, in his situation, Wyatt is not even considering a relationship, long or short term. With plenty of concerns surrounding Wyatt’s safety should his hiding place be discovered, Annamae’s crazy relatives and her never-before met Grandmother, it barely seems as if they have time to find the threads of romance. But, even as Annamae starts to discover what is truly important in her life, she and Wyatt find a connection that is unexpected and solid. While the pacing was a bit fast and the relationship seemed to be in fast-forward, there was solidity to the development of the characters and their connection, even if the issues of media and danger from cartels fell by the wayside. It was a quick read that was easy to follow and brought a smile.